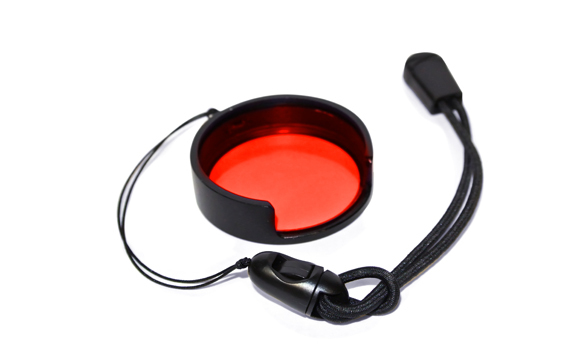 This red filter is a 42mm slip-on filter designed for use with Intova’s X2, HD2, and DUB camera models. The color red only carries 15-20 feet underwater. At depths below this, reds become washed out. Using the red filter puts the red spectrum back into your underwater imagery. Model# I-RED2. Construction materials used: Filter is acrylic, O-ring is silicone, the metal ring frame is aluminum and the lanyard is neoprene/plastic.